First, I’ll give an overview of the Canadian and Alberta GHG reduction plans, including corrections necessary to perform an integrated analysis of the two jurisdictions’ targets, baselined to current emissions. Then I’ll show how the (corrected) emission scenarios play out until 2020 and 2050. Two years ago Canada signed on to the non-binding Copenhagen accord, touting this as a “replacement” for the Kyoto protocol (which the Harper government had always opposed). Canada agreed to match U.S. 2020 targets; both were set at 17% below 2005 emission levels in the ensuing list of quantified targets. This was a slight adjustment from the previous Conservative target of 20% below 2006 emission levels, which was set in the 2008 “made in Canada” plan entitled Turning the Corner. Conspicuously absent from Canada’s Copenhagen commitment, however, was any mention of long-term targets. For its part, the U.S. did put forth aggressive, albeit aspirational, longer term targets, including a cut of 83% below 2005 levels by 2050. Despite Canada’s stated position of matching U.S. emissions targets, Canada did not sign on to any such long term targets. The earlier 2008 Corner plan, however, did propose a milder 60-70% reduction by 2050, again relative to 2006; subsequent NRTEE reports (e.g. Getting to 2050) have assumed a target in the middle of that range, that is 65% below 2006 by 2050. While the commitment to that long term target remains vague and is no longer mentioned by government spokespersons, there is a fair amount of detail available on Canada’s short term plan to 2020. Readers might recall environment minister Peter Kent’s fatuous claim that Canada had “already achieved almost a quarter of that 17 per cent reduction”, made when “ethical oil” first surfaced as the government’s communication strategy (it would be a stretch to call it a policy). It turns out that the ever-befuddled Kent actually meant that projected emissions in 2020 are a quarter of the way between “business as usual” (BAU) and the Copenhagen target, but are still expected to rise under currently enacted policies (the details of which are still being rolled out, with much of the effect after 2015). The rest of the reduction will have to come from policies not yet enacted or even proposed. 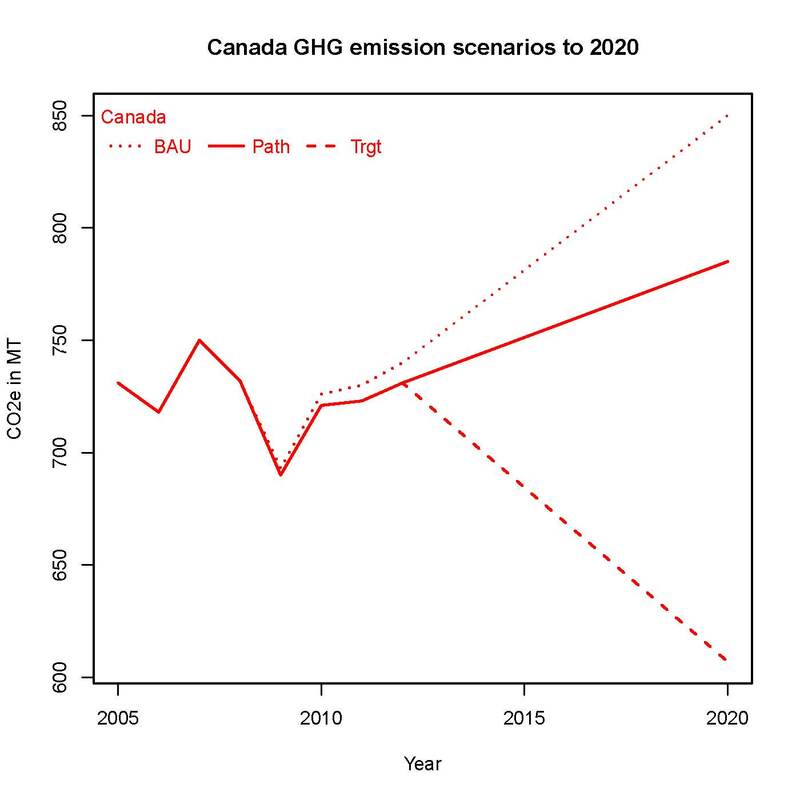 An Environment Canada briefing note shows Canada’s current emissions path, compared to BAU (i.e. without provincial and federal government actions) and the 2020 Copenhagen target. However, this chart does not appear to reflect current estimates for GHG emissions from 2009 through 2012. 2009, the latest year for which official data is available, was pegged somewhat lower than shown at 690 MT. But current estimates from Environment Canada call for emissions to rise to 731 MT in 2012, somewhat higher than the 715 MT shown and exactly the same as the 2005 baseline reference. The “no action” BAU figures for 2010-2012 are also higher, as they are based on adding back the very low estimated difference that policies have made so far. The discrepancies probably arise from a failure to update the chart since late 2010, as 2008 was the latest “actual” available at that time. Regulations applying to the coal-fired electricity and transportation sectors, comprising 39% of GHG emissions in 2005, have already been announced and are reflected in the above scenarios [as noted on p. 3-4 of Canada’s latest Kyoto report, published in May 2011]. So it is not clear how the government intends to make up the yawning 178 MT gap between projected emissions and the 2020 target. Complicating the picture is that most emission sources are subject to overlapping federal and provincial jurisdiction (such as electrical generation, where policies in the three largest provinces are more restrictive than the new federal regulations). Other levers, such as tighter building codes, are exclusively in the provincial bailiwick. The Harper government has long opposed a carbon tax that would be the most efficient way of engendering lower emissions. But they have also ruled out a cap-and-trade system, after promising such a “made-in-Canada” scheme in 2008. And regulations of the oil and gas sector are still in the “pipeline” and are not expected to have much impact until after 2020. So there appears to be little chance that the 2020 interim target will be achieved. Nevertheless, here is a schematic of the follow-on 2050 targets mentioned above. Both assume the 2020 Copenhagen target, with the Turning the Corner target (dotted line) and the more aggressive U.S. Copenhagen 83% reduction target (dashed line), diverging thereafter. The “Corner” target (250 MT) is presumably still government policy, but the more ambitious Copenhagen based target (125 MT) is arguably the minimum that would be acceptable to many of Canada’s UNFCCC partners, especially Europe and major developing countries. Alberta’s climate change plan is summarized in the following chart from the official Alberta climate change strategy [PDF]. Although Alberta is home to only 11% of Canada’s population, the province is responsible for roughly a third of national GHG emissions. The oil and gas sector accounts for a large portion of that, with fast rising oil sands production driving the current climb in emissions. But Alberta is also the province most heavily dependent on coal-fired electricity. New coal-fired power plants were commissioned in 2005 and last year, with another already granted interim approval at Grande Cache, (thus escaping the new federal regulatory restrictions). There is a discrepancy between the Alberta 2005 baseline of 205 MT, and the value of 232 MT given in the official Environment Canada National Inventory Report for 2005. In general, Alberta appears to underreport by about 25 MT per year, compared to the federal figures. I have adjusted the scenarios upward to account for this discrepancy, resulting in a BAU scenario of 400 MT in 2050, and a corresponding target of 200 MT (still 50% below BAU and 14% below the 2005 baseline). The “current path” reflects NIR figures where available. Unlike Environment Canada, Alberta has produced no detailed evaluation of plan performance. However, a recent analysis by the Pembina Institute indicates that current policies will achieve no more than 14 MT of mitigation by 2020, and quite possibly well under 10 MT. (The report, entitled Responsible Action? An assessment of Alberta’s greenhouse gas policies, is a detailed and cogent critique of Alberta’s current GHG reduction effort). 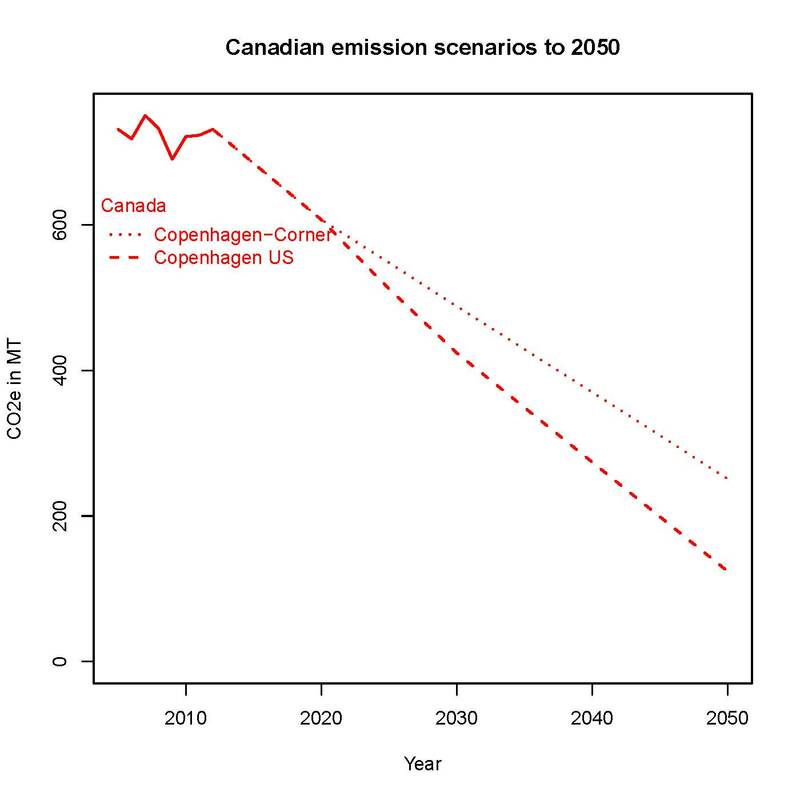 So, as in the overall Canadian case, the current emission path hews much more closely to the BAU scenario than the target (I have optimistically assumed that 15 MT of 50 MT of planned reductions for 2020 would be achieved under current policies). I have also added BAU and target scenarios for the oil sands, which accounts for an increasing portion of Alberta’s emissions. Current emissions are at about 50 MT (2010 estimate) [See table 5 at p. 25 of Canada’s July 2010 emissions trend report]. With daily production expected to triple to 5 million barrels per day by 2035, the BAU scenario shows a corresponding tripling of emissions to 150 MT. However, production increases are expected to flatten out after 2030, so BAU oil sands emissions rise more slowly after then, reaching 180 MT in 2050. 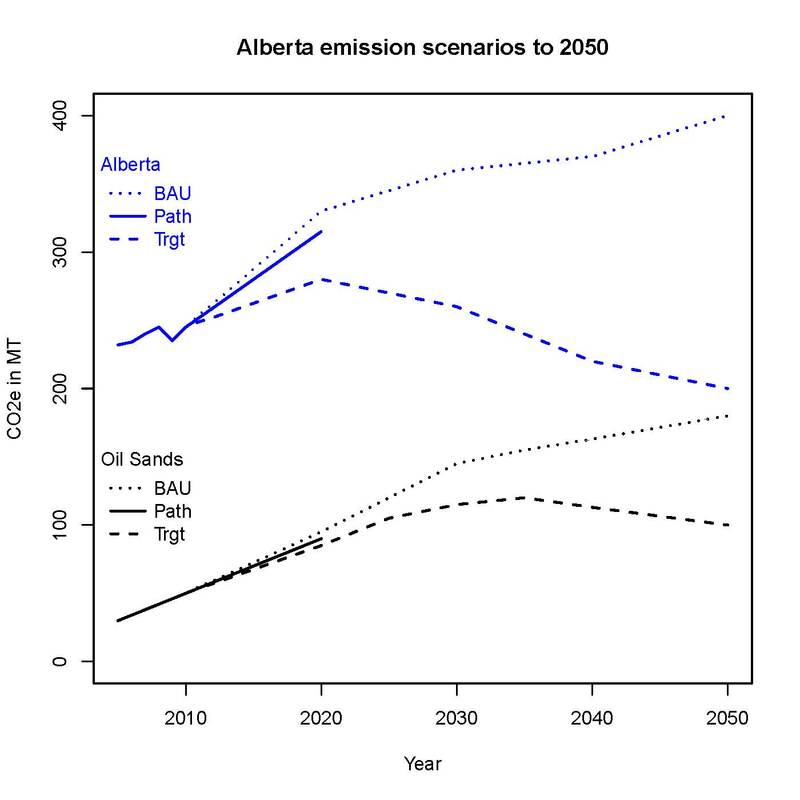 I have also assumed lower mitigation of GHGs from the oil sands, but still a substantial (and probably overly optimistic) reduction of 80 MT from BAU, with 5 MT of that coming by 2020. Putting this all together results in the following chart. Currently, the oil sands account for about 20% of Alberta’s emissions (and 7% for Canada overall). The oil sands scenario above shows that share rising to roughly 33% in 2020 and about 50% in 2030 and beyond, underscoring the increasing role of the oil sands in overall emissions. It should also be noted that Alberta’s plan relies very heavily on CCS (carbon capture and sequestration). Given likely costs of up to $200-$250 per tonne of CO2, depending on the application, it is highly uncertain that this will prove cost effective. In the short term, four heavily subsidized projects are planned; it is not clear which of these will be delivering reductions by 2020. Now we are in a position to compare scenarios. First, let’s look at the picture to 2020. I’ve added one more set of scenarios: Canada without Alberta (in green), which is simply obtained by subtracting the Alberta scenario paths from the Canadian ones. As noted previously, it is highly unlikely that the 2020 targets will be met, either in Canada or in Alberta. But a look at the target scenarios shows another problem. The Alberta 2020 target is 280 MT, about 45% of the overall Canadian target of 609 MT. 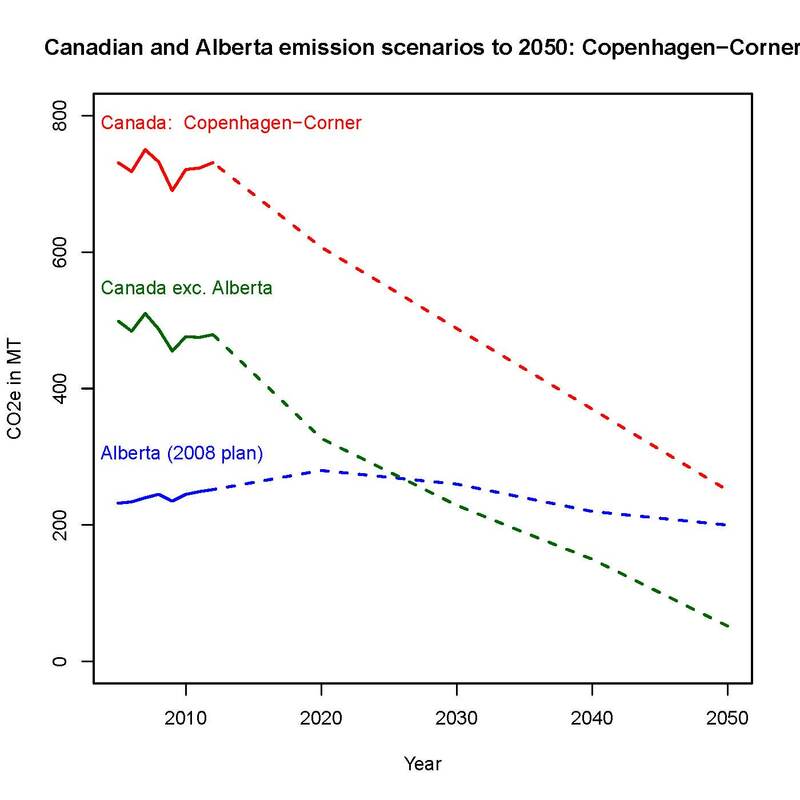 Even if the Alberta target could be met, the rest of the country would have to reduce current emissions by about 150 MT, or a whopping 30%, to match the Copenhagen target. And this would have to happen in eight short years! 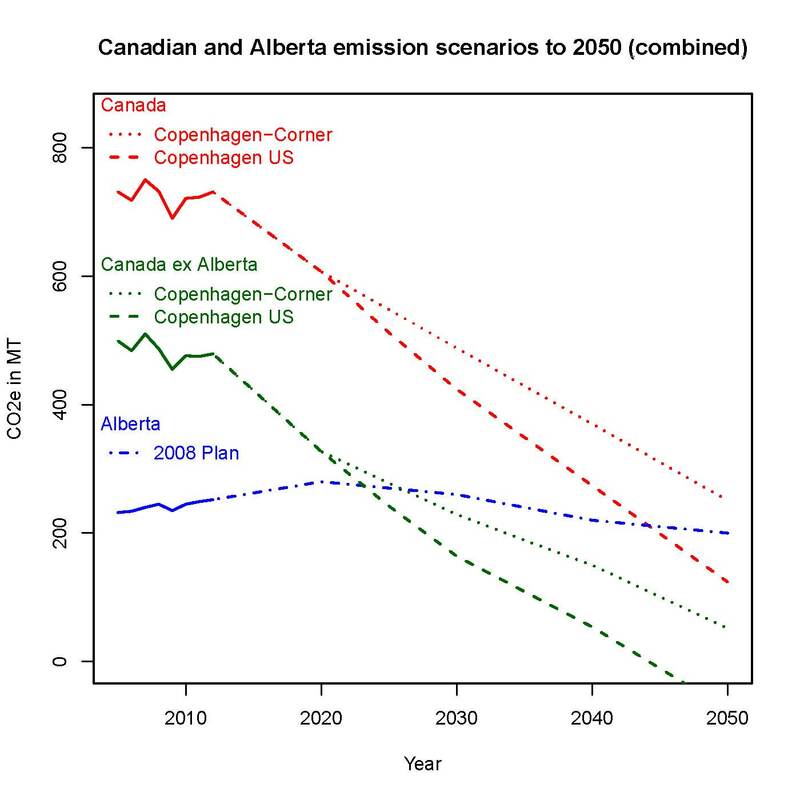 But the situation is even worse when we turn to a comparison of the Alberta plan to 2050 with the two long-term scenarios for Canada. 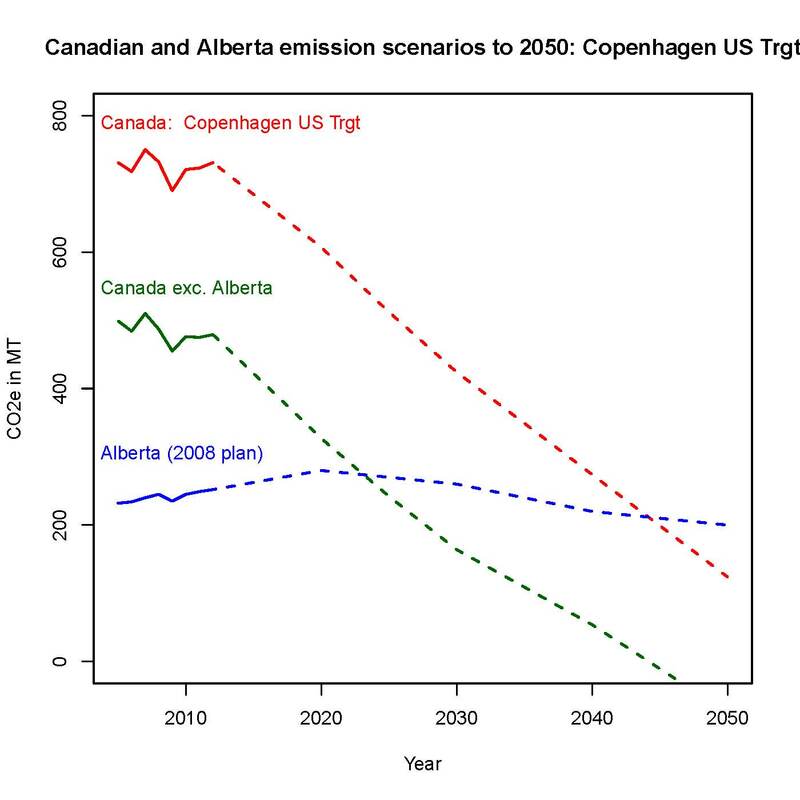 Matching the 2050 U.S. Copenhagen target is clearly an impossibility given Alberta’s current plan, as the Alberta target is a full 75MT above the overall 83% reduction target. Even if one accepts the Canadian exceptionalism implicit in the Corner target, the numbers still don’t add up. 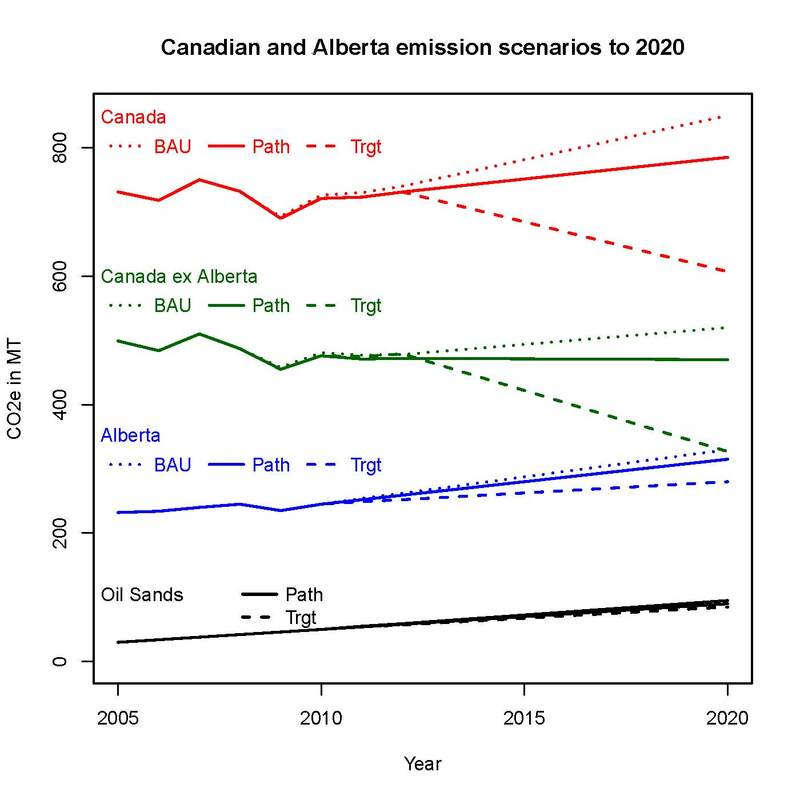 Assuming smooth reduction path from 2020 on, these scenarios show Alberta’s emissions at 50% of Canada’s about 2025, matching the rest of the country (represented by the crossing over of the green and blue lines). In 2050, Alberta takes a full 80% of Canada’s emission targets, leaving only 20% (or a meagre 50MT) for the rest of the country. 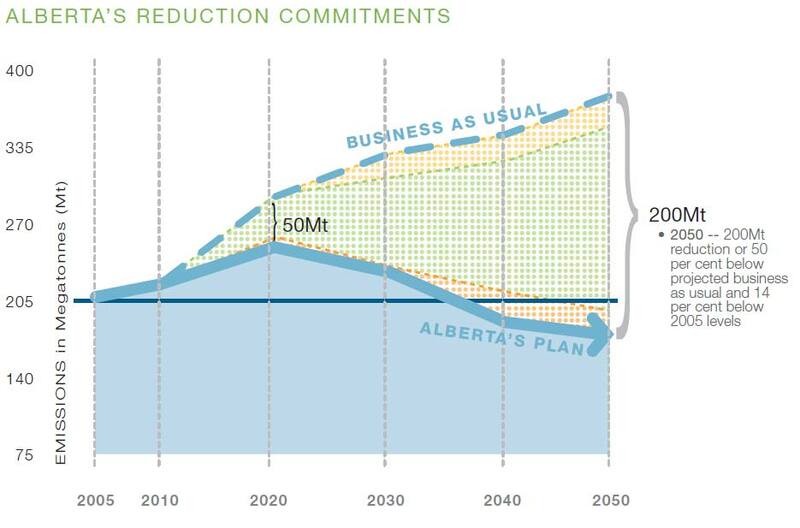 Finally, here is a chart combining the two 2050 scenarios, showing the Alberta target, with its heavy oil sands component, in between the two overall targets. Yet proponents of massive oil sands expansion refuse to admit the obvious: current plans for the oil sands are simply incompatible with any reasonable long-term target for emissions reduction, not even the government’s own. But don’t just take my word for it. Have a listen to economist Mark Jaccard on CBC’s Quirks and Quarks; Jaccard categorically states that the Harper government’s 2050 target is simply unachievable given massive expansion of the oil sands and associated infrastucture, such as new high-capacity pipelines. (Jaccard’s segment on energy starts at 3:20, and his discussion of the path away from fossil fuels begins at 9:00; I’ll be returning to a more detailed discussion of his work at some point). It is also clear that continued oil sands expansion is incompatible with any reasonable scenario for achieving a global target of 450 ppm CO2 by 2050. For example, even the relatively oil friendly International Energy Agency (IEA) 450 Scenario assumes very low growth in the oil sands, as the world moves away from predominance of fossil fuels, especially in industrialized North America and Europe. Those IEA scenarios are also a topic worth exploring another time. But for now, I’ll leave the last word to Jeffrey Simpson, who summed up the situation accurately, if a little graphically. Canada struts on the world stage, naked as a newt, and can’t fool those who know what’s really going on. This entry was posted in Climate science disinformation and tagged Conservatives, Copenhagen, Kyoto, oil sands, Stephen Harper, Turning the Corner. Bookmark the permalink. Without arguing that present Canadian or Albertan policies are adequate, there is clearly a way to reconcile the 2020 and 2050 targets with an apparently incompatible trajectory of actual emissions: international emissions trading. Canada could bridge the gap between actual emissions and target commitments through purchase (by the government, or by private parties subject to a cap-and-trade scheme or similar) of credible international allowances or offsets. While there are problematic or fraudulent units, there are plenty of sound ones too. Trading is an essential component of an effective international climate strategy, since richer countries have a greater moral obligation and financial ability to cut emissions, but physically/economically cannot cut sufficiently within their own borders to solve the climate problem given the scale and growth of emissions in less wealthy countries. Ultimately all significant emitters must take on obligations to seriously restrain emissions, but in the meantime one plausible option is for wealthier countries to take on targets they can’t meet domestically, poorer countries to take on targets that restrain emissions a bit but can easily be surpassed with sufficient funding, and allow the former to pay for a big chunk of reductions in the latter. Of course one problem with this approach is that it relies on wealthier countries being willing to pay for reductions elsewhere. Canada had that option with the KP – despite falling vastly short of its first commitment period targets, it could still have been compliant with a multi-billion dollar purchase of CERs, ERUs etc. But it chose not to. While arguments can be made about the futility of complying with KP1 (I don’t agree, but they can’t simply be ignored), that doesn’t bode well for other commitments. As far as I know, both governments have rejected that approach. Alberta, in particular, has been adamant that any carbon tax monies must stay within its borders. (Alberta does have a technology fund fed by a carbon levy on industrial emitters that fail to meet intensity reduction targets; alternatively, local emission credits can be purchased). Federally, the purchase of “hot air” credits under Kyoto was a major problem for the Harper government, as you note. The one exception would have been a cap-and-trade agreement between Canada and the U.S. But even here, the history is somewhat tangled. Harper’s original plan called for a “made-in-Canada” plan, including a cap-and-trade system. Then, after the election of Obama, a joint U.S.-Canada system was contemplated. But somehow, after the U.S. plan that ran into political problems, the original cap-and-trade plan was also abandoned. I do agree international emissions trading could play (or maybe that should be could have played) a role to maximize early reductions. But ultimately real, actual cuts have to happen. In the long run (i.e. next few decades to 2050), the largest percentage cuts will have to happen in the developed world, if for no other reason that even if comparable economic intensity cuts can be achieved, the developing economies will necessarily have higher growth rates. I suppose we are in “violent agreement”. I do think it is necessary to look at these issues in terms of infrastructure investment. Every time a new oil sands development, pipeline or coal-fired plant is built, that’s a multi-decade commitment to additional GHGs that will be very expensive to mitigate later. Sure, some of it could be offset with trading for a while, but such decisions simply do not represent a sustainable path. Jaccard’s British Columbia example is very instructive. There is an escalating price on carbon and a commitment for government to be carbon neutral. But the BC government also cancelled proposed coal-fired plant projects. That was arguably the real game changer. Ontario has made a similar commitment. Alberta? Not so much.